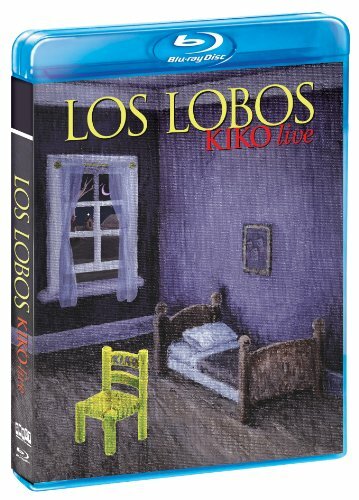 Los Angeles, CA (May 17, 2012) - Los Lobos is celebrating the 20th anniversary of their seminal album Kiko with the August 21 release of Kiko 20th Anniversary Edition On CD, and Los Lobos: Kiko Live (Blu Ray/CD) [Blu-ray] set from Shout! Factory. The Kiko 20th Anniversary Edition features bonus material including demo versions of album tracks and live recordings, and new liner notes written by Los Angeles journalist and longtime friend of the band, Luis Torres. Kiko Live captures their February 24, 2006, performance at the House Of Blues in San Diego, CA, where the band performed the critically acclaimed release in its entirety, during a string of shows devoted to the album. Never before released or broadcast, Kiko Live also contains interviews with the band and others involved in the making of the studio album. The Los Angeles Times premiered a performance clip of "Kiko and the Lavendar Moon" from Kiko Live on Wednesday, May 16 Clip. Released in 1992, Kiko was embraced by fans and hailed by critics as the band's defining moment, the album that put Los Lobos back on the innovation track. The album, wrote All Music Guide, "demonstrated the breadth of their sonic ambitions." Kiko was produced by Mitchell Froom, who received a Grammy nomination for Producer of the Year for his work on the album, and who had previously collaborated with the band on La Bamba. Dubbed "the album of the year" by the Los Angeles Times and the Chicago Tribune, and one of "The Essential Recordings of the '90s" by Rolling Stone, Los Lobos also took home an MTV Music Video Award for Breakthrough Video for "Kiko and the Lavender Moon" in 1993. Prior to Kiko, Los Lobos had been "segregating our influences, treating them parochially," as Steve Berlin puts it: a rockabilly tune here, a Tex-Mex there, some folk, a bit of country, an R&B tune, plenty of classic rock. This time, they decided to take all of those myriad influences out of their separate boxes, toss them into the air and let them fall where they might. "Whatever our unconscious minds' response was to the stimuli, that was what we wanted. We let our imagination take over and didn't try to control it." They began recording new original Hidalgo-Perez compositions such as "Two Janes," "Peace," "Arizona Skies," "Short Side of Nothing" and "Rio de Tenampa," self-producing and following their instincts sound-wise. Comments the band's Cesar Rosas, "With that album we didn't want to be tied down to all the conventional ways of recording, so we started experimenting and making up sounds." To date the beloved band from East L.A. has recorded 18 albums, including their most recent studio album, 2010's Tin Can Trust. They've won multiple Grammy Awards, and continue to tour regularly. Born out of the desire to have a community-conscious event celebrating food, culture and music in their hometown, Los Lobos recently held the 1st Annual Los Lobos Cinco de Mayo Festival at Los Angeles' iconic Greek Theatre. The festival featured performances by preeminent LA bands X and Mariachi El Bronx, among others, with special guests Neko Case, Alejandro Escovedo, Dave Alvin, Phil Alvin, and Flaco Jimenez joining Los Lobos on stage. Next year Los Lobos will celebrate 40 years together, a monumental achievement in a world where bands come and go in the blink of an eye. A rare example of longevity in a volatile music world that stresses style over substance, Los Lobos' lineup has remained uninterrupted since 1984, when Berlin joined original members Louie Perez, David Hidalgo, Cesar Rosas, and Conrad Lozano, each of whom had been there since the beginning in 1973. "This is what happens when five guys create a magical sound, then stick together for 30 years to see how far it can take them," wrote Rolling Stone, and indeed, Los Lobos is a band that continually reboots itself and expands its scope with each passing year, while never losing sight of where they came from. "There's this thing that still happens, this musical thing," says Perez. "But if you took everything away, even the music, you'd still end up with four guys who were friends and hung out and grew up in the same neighborhood. And you can't take that friendship away from us." Shout! Factory is a diversified entertainment company devoted to producing, uncovering and revitalizing the very best of pop culture - The Stuff You Grew Up On But Never Outgrew. Founders Richard Foos, Bob Emmer and Garson Foos have spent their careers sharing their music, television and film faves with discerning consumers the world over. Shout! Factory's DVD offerings serve up classic, contemporary and cult TV series, riveting sports programs, live music, animation and documentaries in lavish packages crammed with extras. The company's audio catalogue boasts Grammy(r)-nominated boxed sets, new releases from storied artists and lovingly assembled album reissues. These riches are the result of a creative acquisitions mandate that has established the company as a hotbed of cultural preservation and commercial reinvention. For more on Shout! Factory, visit www.shoutfactory.com. "Holiday House Party With Los Lobos"